What happens when 50 winemakers, two food trucks and a well-stocked cheese table all meet in a cathedral on a Sunday afternoon? If you’re a glass-is-half-full type, it’s an edible religious experience. If you’re not, it’s the eighth deadly sin. Last Sunday, Señorita Vino was craving some religion, which is how she ended up in a deconsecrated Catholic cathedral with a hundred other wine lovers at a Rhone Rangers wine tasting. For those of you who may be wondering, the Rhone Rangers is an association of about 200 winemakers who make wines in the U.S. using grapes that are traditionally grown in France’s Rhone Valley region. 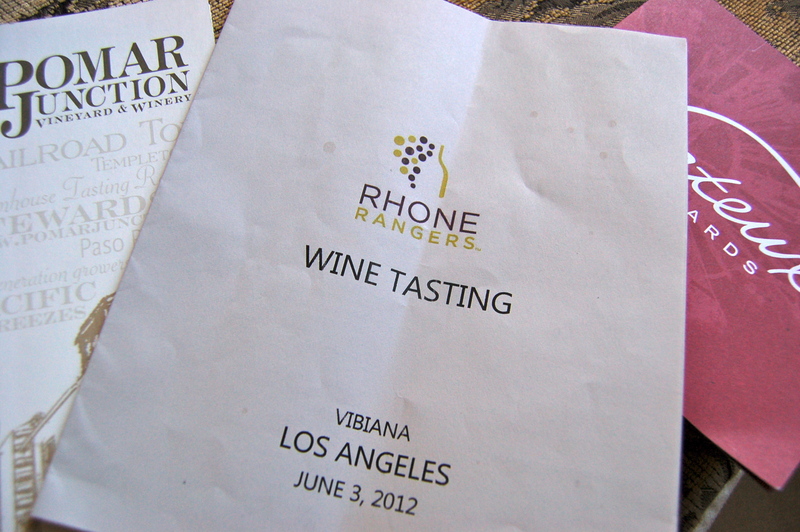 About 50 wineries were represented at the June 3 tasting at Vibiana in downtown Los Angeles. Most of the winemakers made the trek from Paso Robles, a California wine growing region known for its Zinfandels but very friendly to Rhone Valley grapes. Although the French government recognizes 22 official grapes in the Rhone Valley, the most common red Rhone varietals are Grenache, Syrah and Mourvedre. Next time you’re out wine tasting and you hear the term “GSM,” it’s wine-geek speak for the three most widely used red Rhone grapes. For white grapes, Roussane, Marsanne, and Viognier (see last week’s post) are the most popular. 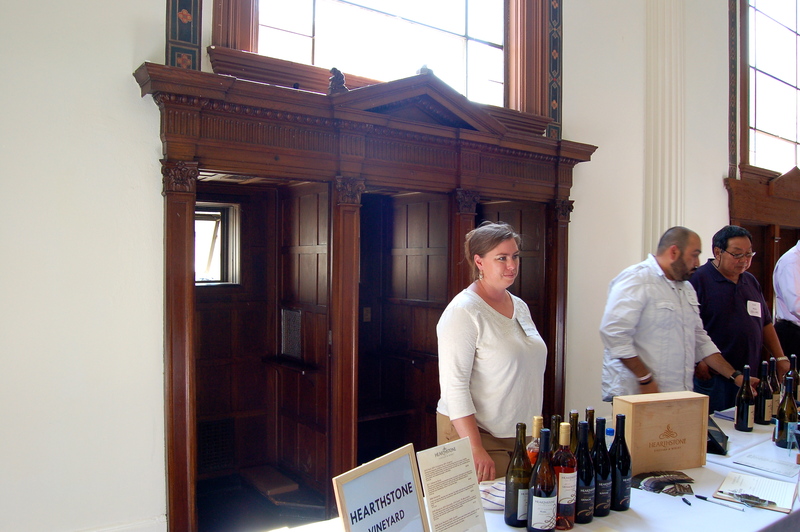 Church of Vino: Wine lovers mill about in front of the former altar. Bottles of white and rosé wines perspired in ice buckets on long picnic tables in the courtyard while the winemakers themselves sat down to answer questions about their wines in a refreshingly informal setting. The scorching L.A. sun was anything but refreshing, so we finished eating and sought shade at one of several cocktail tables on the perimeter of the courtyard. It was here that I had the pleasure of meeting representatives from ANCO Fine Cheese, a company that exports cheeses from Europe to stores and restaurants in L.A. and beyond. Now, if there’s anything that motivates me more than a good glass of wine, it’s the promise of a cheese table the size of a school bus. Okay, maybe not that grande, but you get the idea. If you want to talk about a moral dilemma, mine was how to reconcile the desire to indulge in Death by Cheese with the virtues of fitting into my jeans. Chicas y chicos, the cheese won. Confessions of a vino lover. 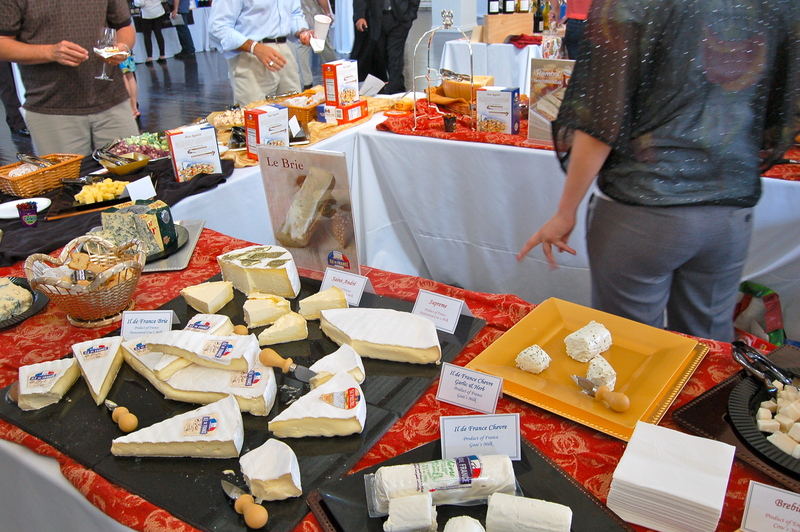 Luckily for me, I spied two empty confessionals just waddling distance from the cheese table. But I got a little sidetracked by the 2008 “Lodestone” red from Hearthstone Vineyard and Winery. This was a blend of 50 percent Syrah with Grenache and Mourvedre. Wonderful black cherry aromas with a touch of pepper and anise. Just the thing to take your mind off atonement. And while we’re on the topic of atonement (or in this case, lack thereof), the nuns at my all-girls Catholic high school reminded us daily where bad girls would end up. But I will submit that well-intentioned girls (and boys) with a weakness for cheese and vino gather at the Cathedral of Wine. Pamela, this sounds dreamy! Queso y vino en una catedral…take me next time you go. As always I love to learn about wine and will look out for wines of the region you mention. We really enjoy syrah and garnacha. Un abrazo! This event seems so great! Can’t wait to go to LA in July so I can try some vino fresh from California. So happy you’re coming to LA! I’ll take you to some of my favorite wine bars. oh my goodness! a wine tasting of that size in a cathedral! how sacrilegious! LOL! Fantastic stuff! That is too cool that is totally my type of event! thanks for sharing! Mirala! What a good girl going to church 🙂 The event looked life fun. What a unique way of gathering like-minded people. 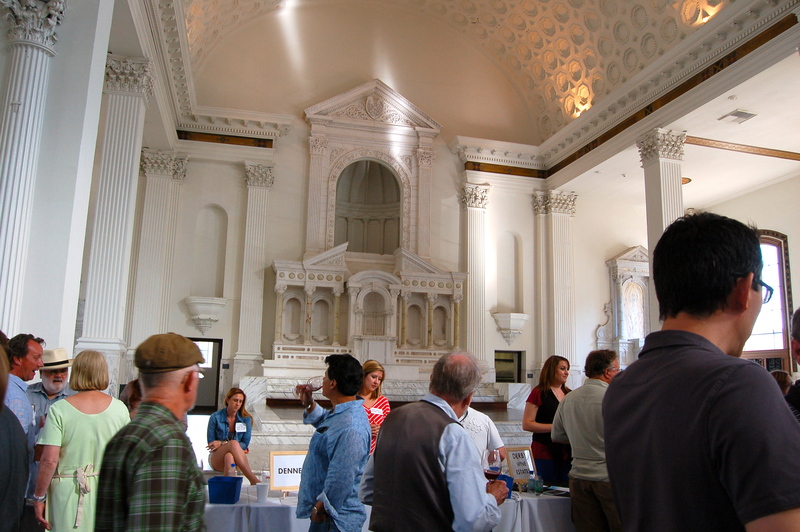 What do you get when you combine wine, cheese, food and a deconsecrated church? A resounding “¡Viva la Virgen!¨ (a typical Spanish expression). I love wines from the Rhone Valley, particularly grenache. Heck I love ’em all. Now if I could only get them to throw in a wine tasting at my local parish. Sundays would be so much more fun. Oh why don’t I live in CA? I say go ahead and try to organize something at your parish. Wine tastings make great fund raising events! The whole food truck thing totally cracks me up! This looks like such fun! Missed it! When is it happening again? We are looking to rebook the event, perhaps a bit earlier, and perhaps add a seminar, or dinner on Saturday, and maybe expanded food options. Thoughts? It’s my pleasure, William! Congratulations on a successful event – I think all of the wineries there did a fabulous job representing the wide scope of the Rhone Rangers’ winemaking talents. 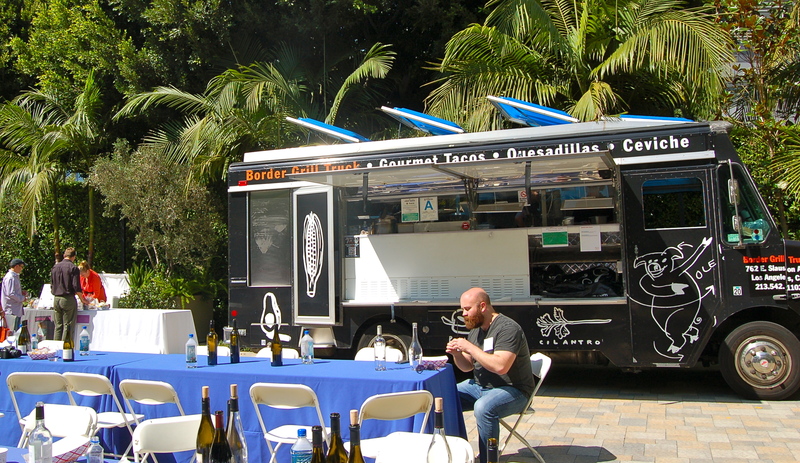 I love the idea of adding a seminar and winemaker’s dinner for next year’s event. 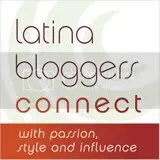 My blog is aimed primarily at people (in particular, Latinas) who are relatively new to the wine world, and I think an educational seminar would perhaps attract a new demographic. Regarding the dinner, L.A. has evolved into foodie mecca, so I think a Saturday food and wine pairing dinner would be a success. And no worries about the weather. It was not at all typical for this time of year, but it forced us into the shade where we met and socialized with some of your wonderful members!